Arayo and I are celebrating today, for today is the most important day of the year. No country that I know of was formed on this day, and none in need was overthrown. No walls came down, none went up. Mother Teresa and Ghandi both entered this world on days that weren't today. And Hitler waited until April 30 to croak, so we aren't celebrating that, either. For most people, April 17 is one of those ho-hum, nothing to shout about days. But then, the rest of the world hasn't been touched by the same bond, the same sweetness, that I have. The sweetness that is Arayo. You see, I've lived the majority of my life with a 100 pound black mass of drooling, shedding dog at my side. Falling in love with the Newfoundland from a write-up in a dog book, I was totally suckered in by my first Newf sighting. At a community square in Oslo Norway, I spotted a man with this massive creature by his side and overcame a nearly debilitating shyness to approach him to confirm that this was, indeed, a Newfoundland in the flesh! Where some girls dream of becoming Miss America, of marrying a Kennedy, being a doctor or finding a cure cancer - mine was to be owned by a Newfoundland. Perhaps I should have aspired to greater things, but I'm happy as a pig in poop as long as I have my Newfoundland and she is happy and healthy. 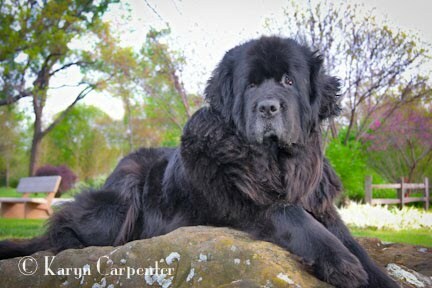 My first Newfoundland was Tara. Probably the least of my girls in terms of pedigree, she lived until 14, was my sidekick when I worked the night shift as a DJ, rode the highways with me as I gave presentations through 4 mid-west states, and journeyed with me to the wild island of Sicily. Eylah was my second - my Sicilian model. Where Tara was my friend, Eylah was my teacher. Reminding me on a daily basis that we have today and only today, so live it to its fullest. I lost her at 7 to cancer, then began my search for Arayo. The search was long, but worth it. There was a special soul I was looking for in a puppy. Gentle, not shy. A dog with an innate ability to forge connections - to love the homeless man in the street, the little old lady with a walker and the child in a wheelchair. Arayo has been all that and more. She's been a wonderful ambassador, fitting in wherever our journeys have taken us. Arayo was our sweet companion as my mother lived her final months - laying her big head on Mom's lap, being here for me to hug at the end of a long brave fight. And, today - April 17, 2011, Arayo celebrates her seventh birthday. Seven years - it is so hard to believe! It seems like yesterday I was sitting in a barn watching her play as a 7 week old puppy. Arayo has been with me for some pretty major events, but still….. Seven years? Really? Then, I look more closely at my girl. Try as I might, I can't ignore that her black muzzle is sprinkled with lots of white. Her deep brown eyes peer at me with love and understanding, but I see a milkiness within them that wasn't there a year or so ago. 2,555 days she has been on this earth. I know our days together are numbered, though I pray the Gods are kind and bless us with another 2,555. I promise to cherish each and every one that I'm given to share with her. Today, I'm surrounded by so much that needs to be done, but the piles will be here tomorrow. The calls can wait to be made. Today, I'm taking Arayo to the park where she can sniff the playground equipment for messages that only she can read. We will drive to the dam, sit at the river's edge and watch the muddy water make its way towards the Gulf of Mexico. Tonight we celebrate with ice cream and cake. If you are fortunate enough to have a Newfoundland, or any dog in your life - I invite you to take time out of your busy schedule. Do something special for your friend today and marvel at how lucky you are to share your life with this soul. Tonight, join us in a virtual birthday party. Bring out the ice cream, serve up a big dish and end your day with with hugs and belly rubs. We are blessed. Happy Birthday Sweet Arayo, your Mom has taken you on the greatest adventure ever! Cheers! I love best about Arayo that she always seems to sit right behind your front door so that every visitor to your house falls over the dog first, and while on the ground is being slobbered to pieces. That's a good thing because EVERY woman over 40 needs a face lick! Jennie with Malia 15 months old and Liam 10 weeks, both beautiful Newfs, but then Newfs are just that. What a beautiful tribute to Miss Arayo, and really to all Newfs. They are truly special. Very cool. Happy Birthday Arayo! This one had me crying, it is the perfect description of your wonderful girl. She truly is the spice of life. I raise a toast tonight to you and Arayo, for many more happy years together. Hugs to you, my friend! Orion and Kee send their love to you both! You made me cry! I go away from your blog for awhile and come back tonite and read the tribute to newfs in your life and realize how very much i miss the three + my saint with whom I was blessed. Each had a beauty and a different role they played in making me the person i am today. However, maybe because Ben was the only one I had twenty-four seven, he is the one I miss so terribly. I oft wonder if part of the loneliness and feelings of being unsettled that many times appear to me is partially because for the first time since I finished grad school I have no fur baby. I walk the trails in hopes that I will see lots of fur babies and scored big last Sunday.....mastiff, great Dane, Sammy, malamute and those wonderful mutts! Thank you for sharing you in such beautiful words. Tell A I miss our times on the rock and her mom's casual get togethers! Happy Birthday Arayo. You are a lucky puppy to have a mom that loves you so much. You are part of a family and that makes life very special. Here's to many more healthy years on this earth Arayo! Without Tara there never would have been Eylah. And without Eylah you would never have known Arayo. It is like one big perpetual circle and regarless of life's journey we keep them alive in our hearts. They are all right there with you as you celebrate your life with Arayo.